‘PwC’s Health Research Institute (HRI) found in 2016 that the majority of consumers with chronic conditions are willing to share their health data with pharma companies, including how well treatments are working and information about daily symptoms’. Everyone is reading the tea leaves! Demonetization in India, has shaken up the cash based economy, digital initiatives are making a lot of waves in buy-sell transactions. The economy has doubled its digital drive and e-commerce activities. And yes, digital is the way forward, say the tea leaves! The era of digital marketing is here for savvy pharma marketing professionals who are seeing and experiencing the digital trend daily thanks to the Govt. which is also exhorting the go – digital campaign. The governmental initiatives are creating a whole new class of digital savvy consumers and significant new numbers of people are getting digital literate. Mobile based access is the main way in which digitisation is occurring in India today. The mobile based digital method can be employed to create patient connect programs. - advertisements in medical and nutritional based journals. In this regard it is interesting to recall the very market savvy and patient friendly approach launched by IAP (Indian Academy of Pediatrics), which has launched an educational TV network for patient-waiting rooms in pediatric clinics and hospitals across the country (brand advertising is permitted in their network, based on their selection of brands). This is a fantastic avenue to connect brands with patients in the patient waiting room of pediatric centers. There is humongous scope for digital based marketing approach, which various market operators can cue onto. Imaginary (hypothetical) example: Imagine a retailer sells a hypothetical brand of company P: Green Morning green tea. While raising the invoice, the pharmacist feeds the consumer’s mobile number that has whatsapp installed in it (the number is fed after obtaining the consumer’s permission). The software then takes over. Through whatsapp, the back end software sends a small post. ‘Hi! Welcome to a clean, green and healthy morning! Your great day starts with Green Morning, boil water with a bag of Green Morning goodness dipped in it. The polyphenol EGCG enters the water from the tea bag to offer an amazingly high antioxidant power to quench the toxic chemicals called: free radicals, in your body. Happy healthy mornings are Green Morning dips of healthy joy’. Buy your next pack of Company P: Green Morning tea bags from Balaji Medicals!! Imagine such cyber-engagements, reinforcing messages, sharing consumer experiences etc., through such messaging. There can be many such digital approaches, directly or indirectly engaging with patients and healthcare consumers, and thus produce positive healthy outcomes through influential educational messages. The digital age in pharmaceutical marketing is all set to roll as an unstoppable juggernaut in India. The penetration of healthcare messages and brand messages of pharmaceutical and nutritional products will thus be on a large canvas. A new age of pharma marketing is born, say the tea leaves, … thanks to demonetization and digital social trend. Thanks for reading this blogpost, please scroll down and read all other posts (click on older posts link as and when required), recommend this blog to your acquaintances. 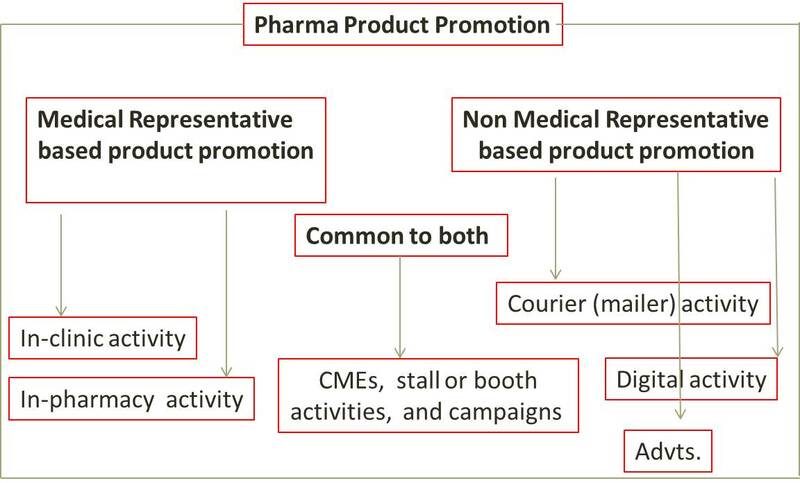 In the above graphic Venn diagram, the universe is Pharma Product Promotion, the major sets are Medical Representative (MR) based product promotion and Non – Medical Respresentative (MR) based product promotion. The main activities in the MR set are in-clinic activities and in-pharmacy activities. 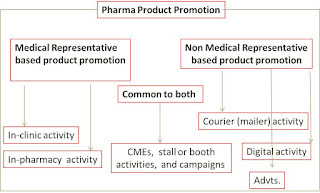 The main activities in the non-MR set are courier activity (mailer promotion), advertisements in medical journals and digital marketing in websites, through mobile aps, whatsapp, email, banner advertisements etc. At the intersection of these two main sets we have activities that may be carried out by MRs, or by outsourced agencies (non-MR route) (this can be done by digital format also) – and these activities are: CMEs, stall or booth activity and campaigns.